Bleary-eyed from jet-lag, I stumbled into the London daylight to hunt for food. Language was no barrier but it was daunting to step into a world of new customs. 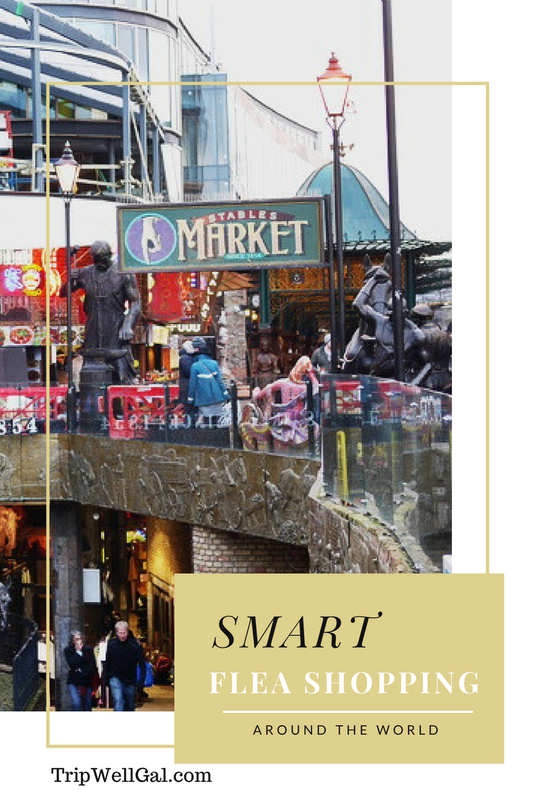 Camden Market was one of my first forays and the jumble of people, vendors, and bargains kicked my senses into high gear. It was the beginning of a three-month, back-packing trip so I didn’t have room for souvenirs, but I’d just become an international flea shopper. One of the biggest tricks to becoming a successful traveling flea shopper is making sure you have room in your luggage or know a bit about shipping things back home. In Bangkok, I longed to purchase a large carving. The price was great but I shied away from purchasing it. Now I know that if I’d taken the time to work with the vendor on shipping and secured documents, I’d still be living with that piece. Later, I admired friends who returned from Turkey with a unique, silk rug after haggling in a souk for hours. Haggling is difficult in countries where you don’t speak the language well and it’s near impossible with no shared language. It’s important to know when negotiating is part of a culture or not. Observing others and asking questions helps. However, in poorer countries haggling over pennies just because you can won’t really do anyone any good. Consider the cost of living, how long it took to make, and how that person is dependent on the sale compared to the luxury of visiting their country. There are famous indoor and outdoor, seasonal and specialized, daytime and night markets in every most every major city. Small cities often host weekly swap meets and antique fairs. Thrifting is a weekend hunt across the Eastern Seaboard where antique dealers get serious about discovering priceless pieces but this post considers bargain hunting as a pastime and hobby for international travelers. As a flea shopper, you never know where market hunts may lead you. One flight attendant picks up a few items each trip and does well selling them online. Another writer is building a custom shopper service for whatever country she visits. Know your limits. Markets can be dangerous for those with little self-control or who love impulsive shopping. I step in with a budget threshold and love looking but consider myself lucky to escape with light-weight purchases while traveling. Consider taking public transportation to avoid crowds and the angst of hunting for parking. Bring cash. Don’t expect credit card sales from most vendors. Stay safe. Large, established markets are prime spots for pickpockets and grifters. My father had his wallet stolen as he exited the Paris market and it changed our trip. Get there early for the best bargains and light traffic, or get there late to haggle over prices before people start packing up. Bring water and stay hydrated. When you see a toilet use it or ask about where the cleanest ones are. Pace yourself. Plan on eating at the market to keep your energy up. Look for the freshest and unique local foods. Don’t force a travel buddy to shop with you if they’re not into it because neither of you will enjoy the outing. In larger markets, if you see something special and can get a decent price – go for it. You may never find that booth again! A short list of the biggest flea shopper destinations in the world. The Grand Bazaar on the Upper West Side has special events and every Sunday more than 100 vendors show up. The Brooklyn Flea is in DUMBO and close to the bridge each Sunday. It’s one of the area’s best. 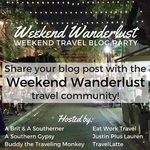 Daytona, Florida – This runs every Friday through Sunday, rain or shine and includes a Farmers Market as well. USA Weekend includes it in the top five flea markets in the country. 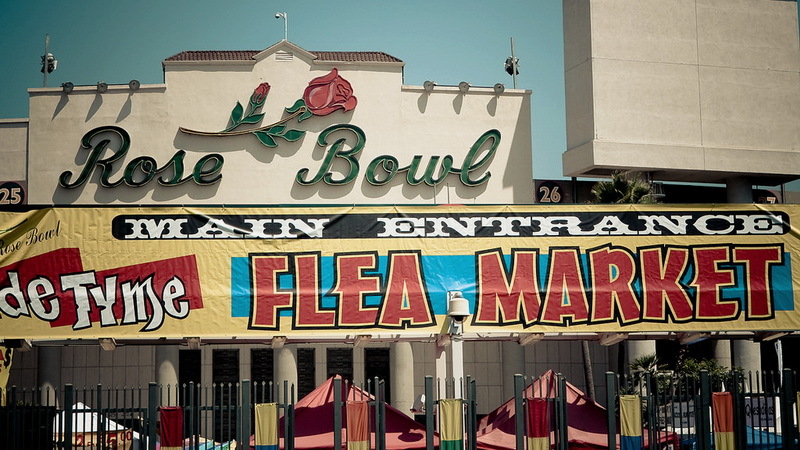 Pasadena Rose Bowl Flea Market – For over 50 years this has been going strong on the 2nd Sunday of each month. There’s an admission and prepare for crowds as over 25,000 buyers attend. Come rested and wear good walking shoes to better navigate across over 2,500 vendors. Southern California Swap Meets have become synonymous with flea markets featuring used and new goods, professional and amateur vendors. In my hometown, San Diego, Kobey’s Swap Meet has been going strong for decades. It takes place in the Sports Arena parking lot every weekend and welcomes novice vendors with equipment rentals from tents to racks. Admission is $1 Friday and $2 Saturday and Sunday. 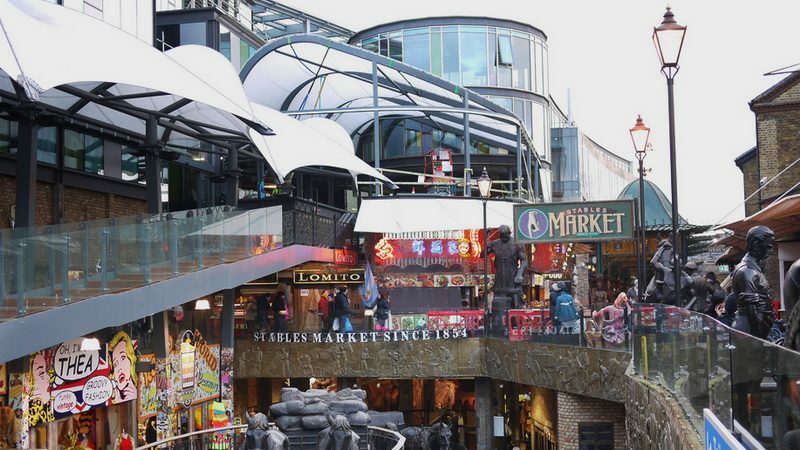 Don’t expect to find ‘flea markets’ in London. Seasoned secondhand hunters look for “Car boot sales,” “jumble sales” and “bring and buys.” Over 100,000 vintage hunters gather at Camden Market in North London each weekend. Portobello Market is another of the largest on Fridays and Saturdays. The Market has sections for second-hand clothes to antiques. Sundays are big along Brick Lane and specialized markets are open on Thursdays through the weekend. The Sunday Up Market offers new designer clothing and goods. 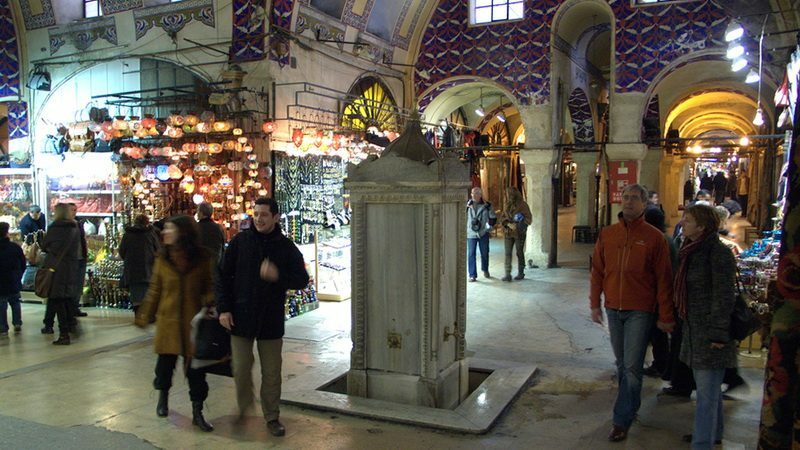 Istanbul – The Grand Bazaar is a destination to itself. Haggle and eat to your heart’s content. 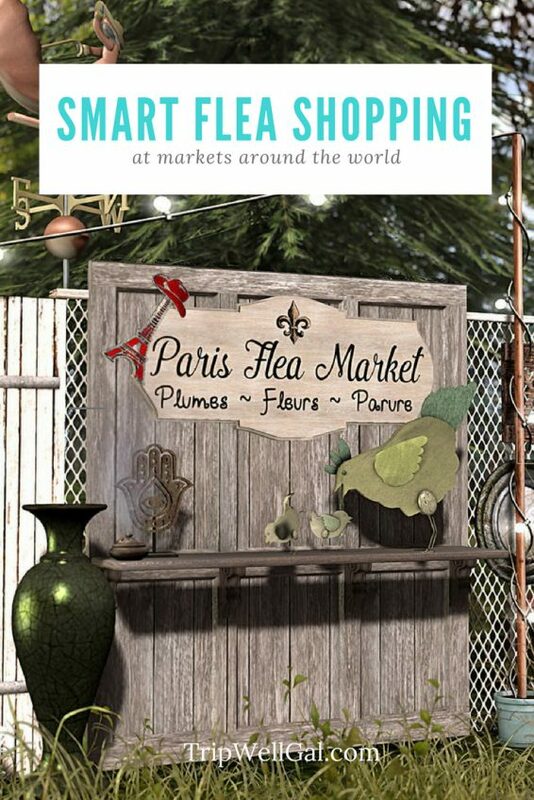 Paris – Boasting one of the largest and longest-running flea markets in the world, Paris doesn’t disappoint. The market is close to the Metro Line but be careful walking through the neighborhood where pickpockets and con-artists sell stolen jewelry. I’ve written about my father being mugged the last time I was in Paris. We were lucky it was at the end of our trip. 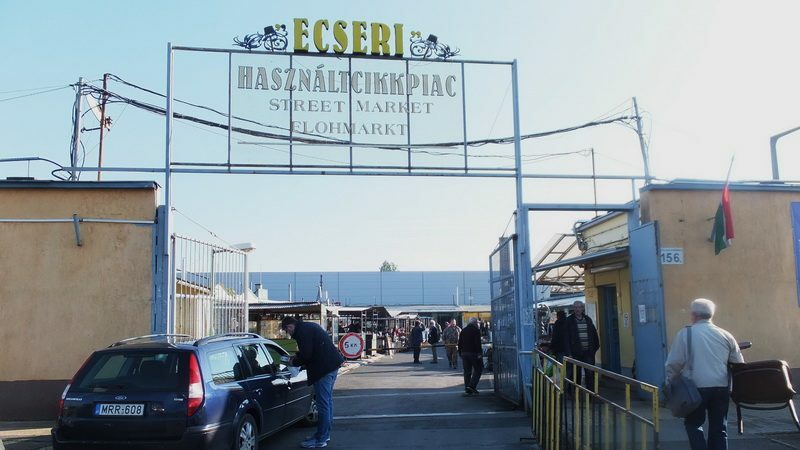 Budapest – There are at least three large flea markets in Budapest. One of the most fabled is the Ecseri Flea Market. The markets across the county are full of antiques and old kimonos, vendors and food stalls. As a dedicated flea shopper, imagine what you could bring home from these markets. Bangkok – The Chatuchak Weekend Market is a contender for the largest flea market in the world spreading out over 35 acres with more than 8,000 stalls. 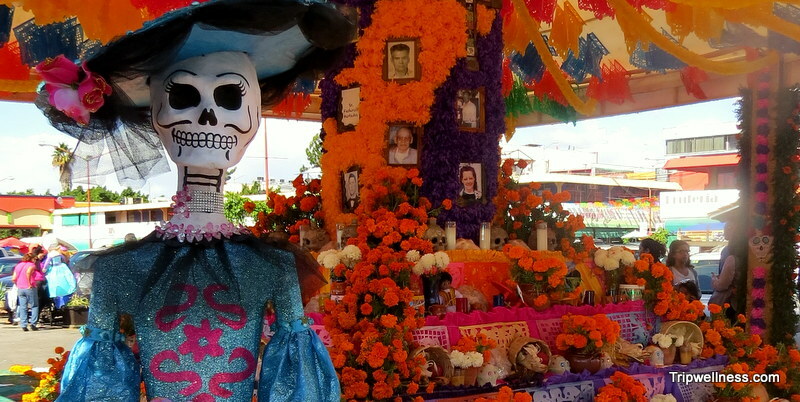 It is estimated that the market receives between 200,000 and 300,000 visitors each day. Most stalls only open on Saturdays and Sundays. Strategize when tackling Chatuchak! Being a flea shopper has opened my eyes to different cultures and people and there’s nothing like shopping with locals to feel immersed in that destination’s daily life. I’ll never forget stepping out of my small hotel in Kosice, Slovakia and unexpectedly into the weekly street market. 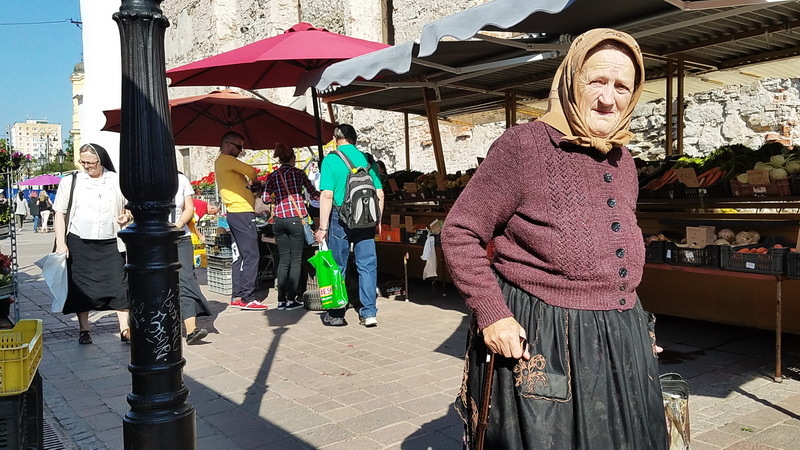 We were in a small square in the center of the old town and discovered that the market has been going strong for several hundred years. Strolling through the farmer’s stalls was an adventure in eating with many vegetables we didn’t recognize. At one table we bought several packets of seeds and now, two years later, we remember that day every time we bite into green beans or harvest oregano from Slovakian seeds. I am an impulsive buyers so flea markets are dangerous places for me! I usually don’t haggle especially when the prices there are already much cheaper, but I will try to bargain next time. 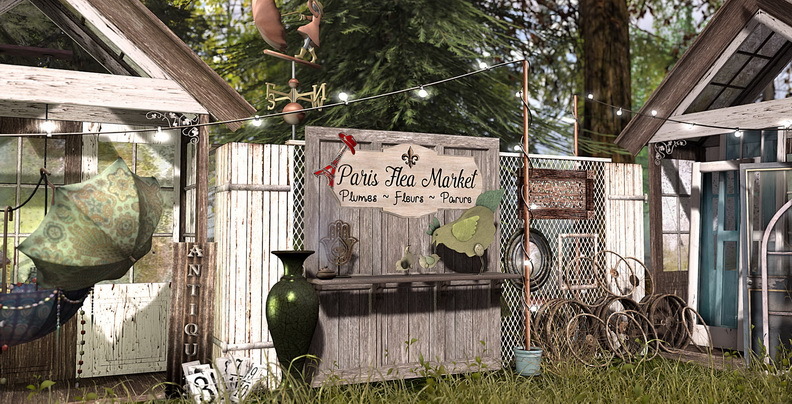 I didn’t know that Paris has a large flea market – we missed that last time. It’s okay, we will definitely be going back so I will need to hit it up on our next trip! I love just exploring the local markets can be a fun way to spend several days even when you aren’t shopping for things. I love shopping in Camden Market. There is so much to explore, see and check out. I want to go check out the markets in Japan and see what find I can make there. I love flea markets. I was at this Parisian flea market with my nine-year-old son years ago. He got the best “souvenirs” there. Things he really treasures from the trip. I love flea markets! But I have to agree with your point – it can be a dangerous place for those with no self control. I’ve seen my mom – she has NO self control and lands up with extra baggage every time! Also, haggling is not something I’m great at, but I make it a point to try it every time I go to a street or flea market and countries like Indonesia, Thailand, India, it really works. People haggle to almost 70% of the price initially quoted! Oh and yea, good tip about taking a taxi to avoid parking hassles and also to beware of pick pockets! And of course, carrying cash instead of expecting credit cards to work. Love that you shared so many flea market shopping strategies! I used to go to the ones in LA before but I’ve never been to any recently. I enjoy going around markets whenever I travel and I would love to visit the flea markets in Europe! I don’t know about finding bargains in London….. It’s always interesting to hear about “the one that got away”. I bet you know exactly where you would keep that carving. I have had friends come to San Diego for the Sports Center flea market too. Have you heard about the 127 garage sale through the midwest? It’s over 700 miles long! One year, I went to Amsterdam for Queensday and visited the flea market there. I’ll admit, I paid a euro to throw eggs at a guy in the stocks, but I don’t know what that says about my human nature or what it has to do with yard sales. I also bought a set of stacking Russian dolls there. Even though the didn’t have anything to do with Holland, they were one of my daughter’s favorite gifts from my travels. There is definitely a place for flea shopping while on the road. I’m tickled that you’re such a flea market connoisseur! The time spent at big markets makes it easier to return home with truly unusual, affordable souvenirs too. I’m a terrible negotiator so my husband MUST go with me. In fact, he likes to shop more than I do. I like to people watch and “window” watch as well! These are really good tips for visiting a market anywhere in the world! I’m not much of a negotiator either but have learned to ask if that’s the best price. It almost always leads to discounts and a sale! Glad you liked the tips, Andi. Oh these are great tips! I love markets and really love flea markets so I’ll definitely be using these tips. We have a fantastic monthly flea market in Nashville – it’s HUGE! This is SUCH a good read! Honestly Im a huge market fan when I travel as you meet locals and see real life cultural exchanges in the locations you travel to IN the market daily! I’ve lived in LA my entire life and not been to the rose bowl market…gotta change that soon. Great guide, thanks! I love checking out flea markets when I’m traveling! It’s such an affordable way of picking up a souvenir. Funny enough, despite living in Budapest for over a year I never went to that one you mentioned above. It’s always nice to come home with something you can display as a reminder of your trip. I love exploring markets and trying to find a unique item. I like your tip on getting an item you like when in larger markets. I’ve gotten lost and not been able to find the same stall again so I if I see something I really want I get it. If later on I end up finding something else I like more then I give the first away as a gift. It’s better than regretting not having gotten it in the first place. I am still really leery about asking the vendors to ship me things, when I was in Morocco I bough a beautiful rug in Chefchaouen and my friend that lives there said he would ship it to me. This is my FRIEND, and he tried (or allegedly tried) to ship it to me twice. Kind of wish I would have just stuffed it in my suitcase, alas I didn’t bring one big enough….. $600 down the drain for 4 of those rugs. I am still just sick about it. So yes, make sure you have enough room in your suitcase, but also make sure that you bring a luggage weigher just in case, to make sure it isn’t too heavy — or ship directly from the vendor themselves. Great tips on this one! Like you, I have had some purchase (or non-purchase I should say) regrets. In Madrid, it was not getting a black/white painting I wanted. In Russia, it was deciding against the Russian nesting doll I fell in love with (because I couldn’t negotiate it into my price range). And just this past month, I really wish I had gotten a rug I found in Morocco. Thankfully, in Thailand (also like you), I wanted a carving and settled on one that I could pack really well in my checked luggage. I keep telling myself I won’t make this mistake again and…ugh. I do agree there is a time to and not to negotiate. Your flea shopper tips are really important, especially the ones on having cash, knowing your limits, and getting there early. I can’t wait to check out Camden Market when I go to London last year and I’m very partial to the Rose Bowl Flea Market because I lived only 2 miles from it for 4 years! I love going to flea markets in other countries! It’s always a fascinating experience and I learn so much about the culture. I think your last bullet is the most important and one I try to live by, because you never know when the treasure you found will be gone! Hi Elaine. I enjoy markets in general, and flea markets, too. We used to spend a lot of time in Florida, and I found their flea markets to be AMAZING. You could find everything there from cheap junk to exquisite one-of-a-kind finds. Love this post as it is such an unusual topic but also so useful! I used to go to flea markets a lot with my parents when I was young. Nowadays, I mostly end up at them when I’m traveling. Not sure why we are just drawn to them when we are on the road… maybe because it gives you a unique insight into the local people? Anyway, great post & resource! Awesome! I love finding an interesting bauble to bring home when I travel. This is a great tip I wouldn’t have thought of flea markets. I do love the ones in London though! 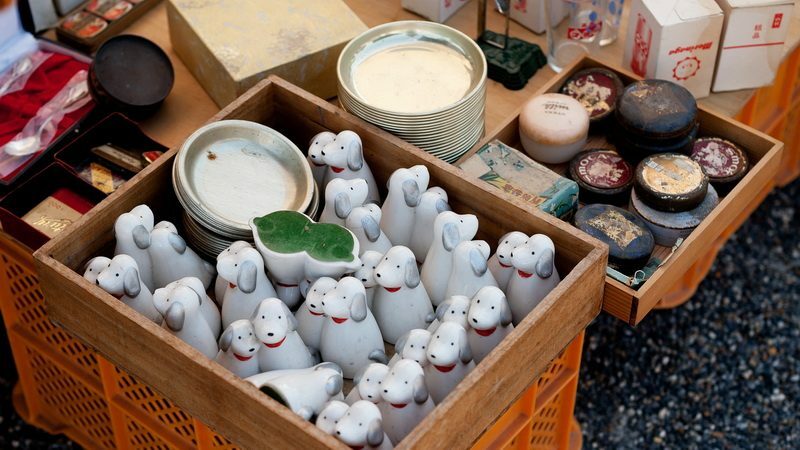 We love flea market shopping, as we can find so many unusual objects. Thanks for adding these precautionary tips to help us remember to be safe while shopping. 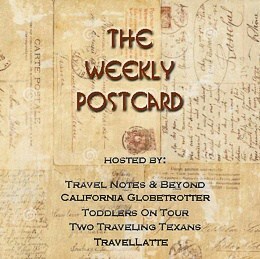 Fantastic post, I love shopping at flea markets and finding those amazing take homes from your travels. I agree planning on having extra space or thinking about hand carries is the best way to really plan or even think about shipping if the vendor does this regularly. I don’t normally buy much when I travel for the same reason that you mentioned, but I haven’t really thought much about getting something shipped directly from the seller. That’s a good tip! There are so many amazing markets in the world! This has opened my eyes to a new world of possibilities for reminders of my travels! Thanks for sharing! I love flea markets. They’re so interesting, colourful and vibrant. You’re right about keeping your spending in check as it’s so easy to be tempted. London’s markets are fun but my favourite is Istanbul’s Grand Bazaar.